The Sitting Volleyball Experience | A busy 4 years! Since November 2013 I have been taking some time out from the Sitting Volleyball Experience, working at Volleyball England as Sitting Volleyball Development Manager. As well as supporting the development of the sport and managing the GB programme I have been involved in a number of exciting events. 2014 saw the launch of the Invictus Games – an event created by Prince Harry to provide competition and rehabilitation opportunities to wounded, injured and sick service personnel. 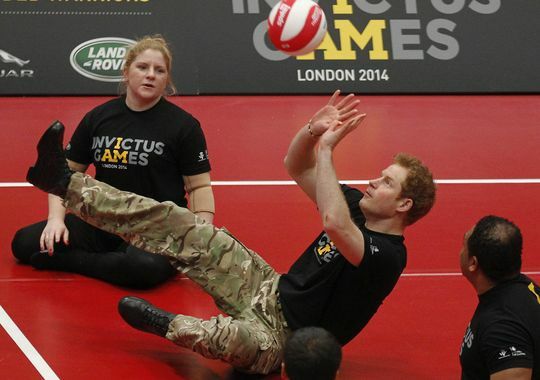 I was involved in the launch event which saw us set up a sitting volleyball court at the Copper Box Arena, where Prince Harry announced the event and then played! We then headed to the BBC studios and set up a court ready for an appearance on the One Show. The event itself saw 8 teams from around the world take part in a competition which culminated in a final back at the Copper Box. I was the competition Manager for Sitting Volleyball event, liaising with teams, officials, volunteers, broadcasters and the organising committee to deliver the event. The final took place in front of a crowd of several thousand and was broadcast live on the BBC. Since the inaugural event, I supported the development of the UK Team that participated in the 2016 Games and am currently supporting the team for the 2017 Games which will take place in Toronto in September. The SportsFest events were advertised as the ‘Ultimate Family Sports Festival’ and they didn’t disappoint! The event provided young people with opportunities to be coached by legends from a range of sports. As part of the event we offered sitting volleyball sessions for all the family to get involved with – the inclusive nature of the game means that people of all ages can enjoy it together. In 2015 we also ran a game between the legends and the UK Invictus Games team. Seeing people like John Barnes, Beth Tweddle and Austin Healey all playing Sitting Volleyball was quite an experience. In 2016 the Canadian Women’s Sitting Volleyball Team came to England as part of their preparation for the Rio 2016 Paralympic Games. The main event of the trip was a competition between them and Great Britain at Medway Park in Gillingham. I coordinated the event, liaising with the local council, venue and hotel to ensure everything was in place as well as working with volunteers and officials to deliver the event effectively. Around the competition there were a variety of other activities taking place including community volleyball sessions and opportunities for local school children to try sitting volleyball and to meet the Canadian Team. As well as the Invictus Games, I have also been involved in a number of other events with military personnel. I have coached sessions at Help For Heroes Personnel Recovery Centres (PRCs) and worked with the PRCs and the Royal Marines to deliver competitions for wounded, injured and sick service personnel. One of the ongoing projects I have been involved with over the last 4 years is the development of a new Talent ID initiative for the GB Sitting Volleyball programme. As well as improving the pathway and creating supporting resources, I have delivered a range of come and try sessions with local clubs and partners such as the British Paralympic Association and LimbPower. We also held National Talent ID days which were organised to test athletes who wanted to progress within the sport. It’s certainly been a busy 4 years working at Volleyball England but I’m excited to be back delivering the Sitting Volleyball Experience full time!